In third grade, through Scholastic book orders, I bought a bound paperback which consisted of both stories. I was all about the animal stories then, and I thrilled over Jack London’s depiction of the Klondike Gold Rush’s rough frontier. I have re-read the book over the years until it’s become this dog-eared, familiar presence in my bookshelves and in my memory. This book is primarily about the British abolition movement, and I certainly learned a lot about this part of world history, especially how the Caribbean was impacted by the institution of slavery and the way it ended there. But the book also lingers in my mind because of how Hochschild told this history – his warts-and-all approach to all the key players, his care to not overlook the contributions of marginalized people whose efforts were not thoroughly recorded by their contemporaries. I also remember the awesomeness of Thomas Clarkson and how I actually teared up when Hochschild described how he was honored at his funeral. Okay, this one is a love-it-or-hate-it book, particularly due to its use of 2nd person point of view (“You ride your bike to town.”). And I haven’t re-read it in a while, so it may not be as good as I remember it being. This short book is about a 19th century sheriff/mortician/preacher whose Wisconsin town is threatened by disease and fire in the same summer. I first read the book in high school, and its creepy, almost apocalyptic, tone made an impression on me. I think it’s mostly the ending that helps this book land on my list – getting sucked into a story where the worst does happen to everyone else and yet “you” are left standing. Smith is a dependably good storyteller, but this book – the first I read – is still the best of them all. Ivy Rowe’s entire life is told through letters, starting with her almost mythic childhood in the Appalachian mountains. It’s one of the best books I’ve read for capturing the journey through time in one person’s life. And it’s that and Ivy Rowe herself that have stayed with me ever since I read it. I read this book and other novels and stories by Welty for a senior high school project. I never re-read the others, but Delta Wedding remained a part of my reading life long after graduation. I may have even bought it with graduation money. Not a lot happens in Delta Wedding, but I was incredibly taken with Welty’s description of the Fairchild family, their house, and that region in Mississippi during the 1920’s. An early scene involves the Fairchild family picking up their nine-year-old cousin Laura from the train station and as she gets into the car, she is immediately surrounded by the chaos of her cousins. Perhaps drawing from my own experiences with extended family, I can almost hear that scene when I think about it. My love for this book is one of several reasons I want to visit Mississippi next year. As with Delta Wedding, The Country of Pointed Firs also has a strong sense of place. The difference here is that Jewett was writing about coastal Maine, a place that I am intimately familiar with as it was my childhood home. The book was published in 1896, nearly a century before I was born, but reading it fills me with such a strong home-feeling, proving that I guess the essence of the place has stayed the same. I read this book once in high school and liked it, but Shute’s novel On the Beach made more of an impression at the time. I re-read A Town Like Alice several years ago, and loved it. It has dated elements, but the loveliness of the narrator – an elderly solicitor – shines through. What I especially like is that it takes the shape of an epic love story (two people thrown together by war and then separated by the same), but then it goes beyond the usual denouement and shows how the character Jean basically reinvents a town so that she can share a life with the man she loves. The world-building is amazing in this book and I love how Mieville interrogates the tropes inherent in the quest narrative. It’s also funny and quirky in wonderful ways. The main reason Un Lun Dun made my list was the way each individual life was valued: no matter how minor the character, each life mattered to the protagonist and to the story. When so many stories have barely-remarked carnage and death, Un Lun Dun seemed completely refreshing in how it dealt with loss of life. I read this 1973 book last year and while I found Schumacher remarkably short-sighted about women in the workplace, his ideas and the way he laid them out have really informed my thinking about economics ever since. My dad, having read my post on this book last year, pointed my attention to this summer’s Market Basket controversy which I had somehow been missing. The Market Basket saga has recently concluded in a happy fashion, where it was reaffirmed that people do matter, but it seems all too rare. In the Post-Birthday World, the book divides into two parallel-world narratives. In one, the main character, Irina, chooses to kiss a man who is not her long-term boyfriend. In the other, she is tempted, but refrains. The book follows Irina on these separate life-paths and the way that decision ripples through her love life, career, and her experience of world events. I loved there wasn’t a clear “bad” or “good” life, though one does seem to leave her more sad than the other. Similar to O’Nan’s book, it’s possible a re-read may diminish my memory of this book, but its take on life-changing decisions is something I still think about. The novel starts in 1962. Natalie Marx’s mother has written to various resorts about summer accommodation availability in Vermont. One innkeeper sends a letter back stating in part: “The Inn at Lake Devine is a family-owned resort, which has been in continuous operation since 1922. Our guests who feel most comfortable here, and return year after year, are Gentiles.” Twelve-year-old Natalie, fresh off reading the Diary of Anne Frank, is both outraged and intrigued by the anti-Semitism of the innkeeper. The following summer – part by chance, and part by Natalie’s design – she manages to inveigle an invitation to stay as a guest at the Inn. Her visit as a teenager turns out to have surprising consequences in her adult life. For a few happy days, I was courted by both sisters [Marla and Shelley], who wanted nothing to do with each other. Marla soon recognized my low social standing on the street – defined by my braces and glasses and twenty-inch bike – and worked her way into the clump of girls a year older (Claudia Forestall, Marybeth McKemmie, my sister, Pammy) who took the public bus to the junior high and dressed alike. Our mothers took us two younger girls to lunch in department stores, pretending we were better friends than we were. That’s how it was on Irving Circle and how I was raised: You made the best out of what was within reach, which meant friendships engineered by parents and by the happenstance of housing. I stayed with it because we both had queenly older sisters who rarely condescended to play with us, because Shelley was adopted and I was not, because Shelley had Clue and Life, and I did not. I knew very little about the plot going in, but was happy to follow wherever Lipman decided to take the story. And Lipman took the story in some unexpected but ultimately delightful directions. These unexpected directions aren’t handled as *big twists* at all, but I still won’t spoil you. I find it is a great pleasure to discover while reading a book that you have complete, instinctive trust in the storyteller. 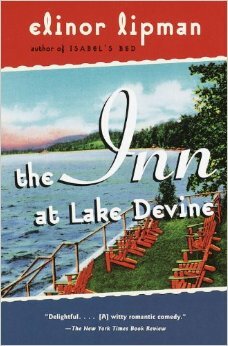 The Inn at Lake Devine is one of my favorite reads of this year. I finished it in a day. I have just recently finished reading Lipman’s novel, The Dearly Departed. I liked it, but it’s not near as good as The Inn at Lake Devine.